The AEG firm used closed-circuit television to identify the source of depressions that appeared on site. 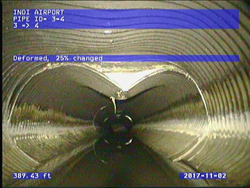 Woolpert used CCTV at the Indianapolis International Airport and discovered stormwater pipes such as this were deformed, causing joints to separate and allowing fill to seep in. Asset management and maintenance are needed to prevent sanitary sewer and plumbing issues that can make a guest’s experience very unsatisfactory. The Indianapolis Airport Authority (IAA) contracted with Woolpert to conduct a stormwater system evaluation to investigate the cause of surface depressions that formed near a large stormwater pipe at the Indianapolis International Airport (IND). Woolpert was on-site discussing projects under the firm’s multiyear on-call aviation engineering contract with IAA when the issue of the depressions was broached. “The folks in Indy remembered we were performing similar stormwater evaluation work with the (Hartsfield-Jackson International) airport in Atlanta (ATL), and asked us to take a look,” Woolpert Project Manager Richard Washington said. Woolpert employed closed-circuit television (CCTV) at IND and discovered the stormwater pipes were deformed, causing joints to separate and allowing fill to seep in, which caused the depressions. Woolpert—an international architecture, engineering and geospatial (AEG) firm—is well-versed in Federal Aviation Administration (FAA) rules and regulations, and specializes in a multitude of services that support airports. These include runway design, geographic information systems (GIS), facility sustainability, airspace analyses, wastewater and stormwater management, and asset management. Washington said routine wastewater and stormwater maintenance can be neglected, since underground infrastructure is out of sight and out of mind. This can lead to significant issues at any site, but these kinds of backups can be especially crucial at airports, where moving passengers safely and quickly is the priority. Woolpert is also working with ATL to update its GIS records for underground infrastructure throughout the airport in support of ATL’s asset management program, to establish a schedule and protocol that will let officials know what pipes need to be looked at and when. The IAA is in the process of addressing the rehabilitation and replacement of the affected pipes to prevent surface depressions, as well as to identify future underground infrastructure issues. Woolpert is the fastest growing architecture, engineering and geospatial (AEG) firm in the country, delivering value to clients in all 50 states and around the world by strategically blending engineering excellence with leading-edge technology and geospatial applications. With a dynamic R&D department, Woolpert works with inventive business partners like Google and Esri; operates a fleet of planes, sensors and unmanned aircraft systems (UAS); and continually pushes industry boundaries by working with advanced water technologies, asset management, building information modeling (BIM) and sustainable design. Woolpert’s mission is to help its clients progress and become more progressive. For over 100 years and with 25 offices across the U.S., Woolpert serves federal, state and local governments; private and public companies and universities; energy and transportation departments; and the U.S. Armed Forces. For more information, visit woolpert.com or call 937-531-1258.